Business card slitters cut full sheets of 10 or 12 up into finished cards quickly and easily. Choose the machine thats right for your shop. The BCS 1000M business card cutter makes it easy to produce business cards whenever you need them. It is a manual machine with self sharpening blades to always guarantee a clean precise cut. The HS-2000 M is a manual business card making machine that works by inserting letter sized paper with cards printed in a 10 up format. The business cards get cut by hand cranking them through. It is ideal for use in low end situations where you run at 10 up. 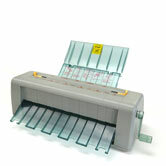 This slitter will produce standard size 2" x 3-1/2" cards and remove the trim. The BCS210 10up business card slitter easily cuts 8 1/2" x 11" paper to 2" x 3 1/2" cards. Features include perfect cuts, catch tray, receptacle and adjustable feed. The BCS212 12up business card slitter easily cuts 8 1/2" x 11" sheets to 2" x 3 1/2" cards with a simple two pass operation. Features include perfect cuts, catch tray, receptacle and adjustable feed. 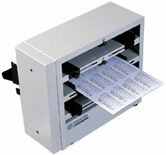 The BCS410 10up business card slitter has the additional option of perforating or scoring. It cuts 8 1/2" x 11" sheets into 2" x 3 1/2" cards. 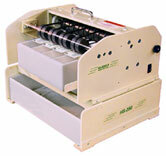 The BCS412 12up business card slitter has the option of perforating or scoring. It cuts 8 1/2" x 11" sheets to 2" x 3 1/2" cards. Features include perfect cuts, catch tray, receptacle and adjustable feed to accommodate different types of material thickness. The MBM BC12 table top automatic business card slitter is a great way to eliminate the costly and time consuming process of outsourcing business card production. Simply print up to 12 standard business cards onto a letter size sheet and the BC 12 will produce 12 perfectly cut business cards in seconds. Capable of producing up to 60 cards per minute, the BC12 Automatic Business Card Slitter saves you time and money by producing big results in little time. The key to it's productivity is its ability to cut 12 business cards in a single pass. It has10 pre-set cutting modes for many other common cutting templates including: 4 up 3.5" x 5" photos, 12 up business cards on legal size paper and many more. 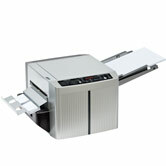 This 4 up high speed business card slitter makes producing business cards easy. The HS 2000 MGC Manual Business Card Slitter is designed to cut an 8 1/2 x 11 8-up format removing a 1/4" trim from between the cards. No need for a guillotine cutter as this slitter will produce standard size 2" X 3-1/2" cards and remove the trim. 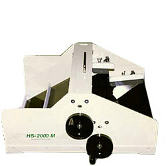 The HS 2000 MGC Manual Business Card Slitter is designed to cut an 9 x 11 12-up format removing a 1/4" trim from between the cards. It is very easy to operate by simply turning the handle first on the lower unit then placing the slit sheet in the upper unit and turning the handle. No need for a guillotine cutter as this slitter will produce standard size 2" X 3-1/2" cards and remove the trim.